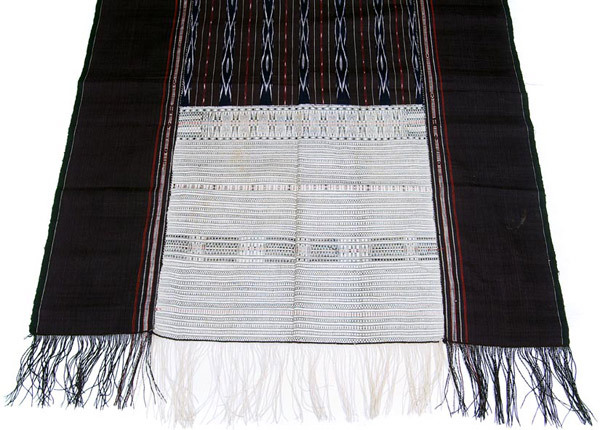 This ulos ragidup was woven in the Tarutung (North Tapanuli) area of North Sumatra and measures 210 x 90 cm. It was given to Tianur br. Hutabarat in August 1943 by her parents as an ulos tondi (protective soul gift) at the traditional ceremony when Tianur was in the seventh month of her first pregnancy carrying Vera (Veronica Pintauli br. Tobing). The base colour of this ulos ragidup is a very, very dark maroon. It comprises three sections with warp ikat in the central panel and supplementary weft end pieces with male and female pinar halak with the female end showing in the detail below. There are supplementary warp stripes on the centre-facing edge of each of the two border panels. Maria DRT Ambesa is the daughter of Vera Tobing and an architect now living with her husband in Java. She has been the essential intermediary allowing these fine textiles and their story to be shared. She arranged for the family ulos to be photographed and has worked tirelessly, together with her mother, to track down information about the ulos, their weavers and to extract memories and photos of the past from a family who have been amazed that there should be any interest in their history or value placed on it as background to the textiles. Maria's patience, persistence and endless cheerful support plus her excellent English, have made the 'Vera Tobing collection' not only possible but a thoroughly enjoyable study to develop. Both Pamela and Maria are very grateful indeed for the encouragement and advice which they have received from Sandra Niessen, a leading expert on the Batak and their textiles. See an autobiography and Batak references for more information about Sandra and her publications.